On February 3, NYU musician Kate Yeager performed her new EP “Your Girlfriend” at The Bitter End. The West Village’s Bitter End welcomed NYU sophomore Kate Yeager this past Wednesday night for the debut of her first EP, “Your Girlfriend.” After performances from two fresh-faced fellow singer-songwriters and a half-hour comedy set, Yeager, now a Bitter End artist-in-residence, finally took the stage. The crowd filtering in was increasingly composed of a beanie-wearing, light denim indulging cast of characters coming from campus to hear her latest effort. As if to immediately shift the tone from the smooth and soft musicians that preceded her, Yeager opened with the first track from her new EP, “Go, Go, Go.” The track, with its upbeat, rambling rhythm, began like a starting gun, indicating to the slightly sedated crowd that this show would not be limited to smooth vocals and lightly strummed guitars. The song featured a somehow still fresher-faced guitarist on a twanged strat that fit in nicely with Yeager’s southern-tinged voice and made the performance far more Alabama Shakes than Norah Jones. The track also demonstrated Yeager’s impressive vocal ability, which proved equally capable of effortless highs as it was of growls and teeth-showing. The set continued, alternating between these two modes through her verses and choruses, respectively, on “Coming Around” and “Slip of the Tongue,” the latter of which fittingly showed Yeager’s talent for scatting and use of her voice as a rhythmic instrument. 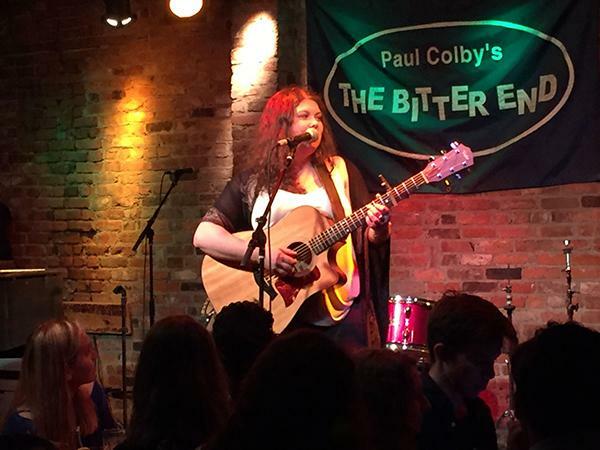 Between songs, Yeager told the crowd she “likes to keep these things personal,” and keeps her promise with a final third of songs lamenting lost loves and feelings of vulnerability. On “Disappointment” she admits her lack of surprise at the unfaithful lover she lost, saying she’s “not as mad as she should be.” The show closed with the only single from the EP, “You Got Me Dancing,” whose sing-song chorus was maddeningly catchy and by far the least interesting song from the set. The strong voice behind Yeager’s bluesy, strummed tunes was the saving grace of the performance, adding an element of roughness that makes for a more interesting and enjoyable show than those of the night’s earlier players. She shows a talent for communicating with the audience, citing a desire to “create something that is every bit of you and share it.” This desire shows in her music, a feat that is made possible by the soaring vocals that are as impressive as they are emotive. “Your Girlfriend” is now out on iTunes, Spotify and Google Play.